Over-pessimism relates to the fear of losing money and normally comes after riding through a bad period in equity markets, where investors get scarred and wounded, or even traumatised. In this case, investors allow the fear of losing more money overwhelm them. Many then shift from one end (aggressive) to the other end (conservative) of the risk scale. In other words, many move from being 100% in equities to 100% in bonds, and remain in the latter for a prolonged period until they are absolutely sure that equity markets are in a new bull market before jumping back to equities again. As we all know, by then, these investors would have missed out on a large part of the gains or at worst, be getting in at a dangerously late stage of the rally. Similarly, over-optimism arises when investors fear that they may lose the opportunity to make money after a period of good performance in equity markets. This is where aggressive investors pile on more risk and conservative investors suddenly morph into aggressive investors. This over-optimism also blinds investors as many continue to hold onto their positions despite the emergence of clear signs that the market has turned against them. A classic diagram that shows how investors’ emotions swing with the market is widely known as the Cycle of Emotions (see Diagram 1). 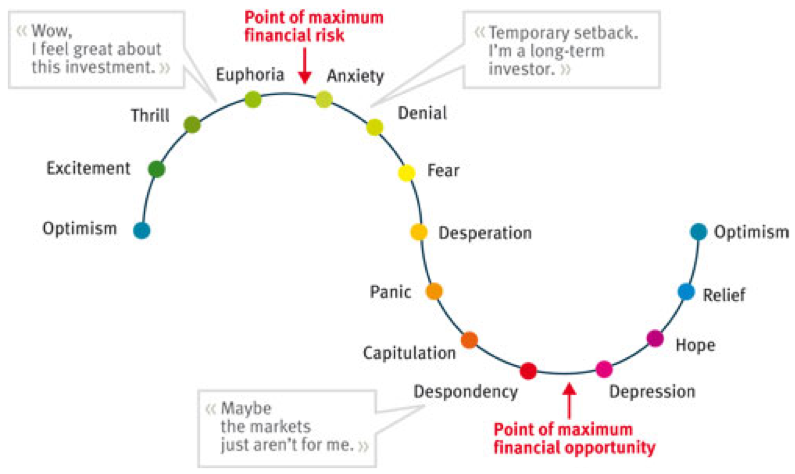 Relating this to what I have mentioned, the rising part on the left of the cycle where the investor feels “excitement-thrill-euphoria” is typically the over-optimistic phase whereas the “panic-capitulation-despondency” phase is where over-pessimism sets in. This diagram also highlights exactly why it is important to understand that how investors feel may not necessarily be the best gauge of how they should react. For example, in the over-optimistic phase, when the market reaches the highest point (euphoria stage), it is actually at the point of maximum financial risk. Likewise, when the market is at the lowest point (despondency stage) it is actually at the point of maximum financial opportunity. 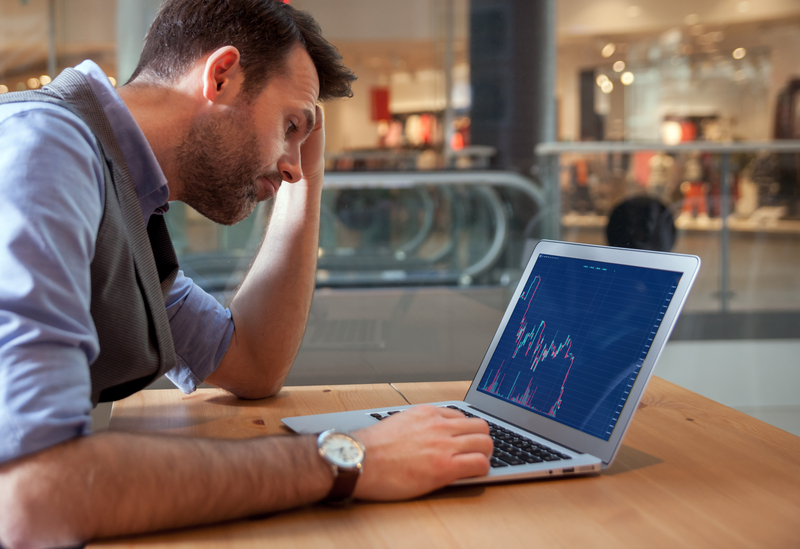 I have come across over the years many investors who allow themselves to be gripped with either of these extreme feelings, thus allowing large losses to occur or end up missing out on big opportunities. When we look back over the past 20 years to find the best opportunities to invest, a few critical junctures come to mind: 1998 (lows of Asian crisis), 2003 (lows of Dot Com/Iraq war/SARS period) and 2009 (Global Financial crisis lows). When we ask investors why they didn’t invest at those points, the reply is the same: fear. So how do investors overcome this counter-productive feeling that is inherently built into humans? Pick up a book on some of the greatest investors or traders in the world and you will find that they all have a common trait – all of them trade or invest without letting their emotions get in the way. For the average investor, this is a particularly difficult trait to nurture. Thus enter the investment advisor. Many a time, it is the investment advisor who actually plays the role of an anchor or stabiliser during periods of extreme emotions (which could either be euphoria or despondency). He or she is tasked to inject rationality in situations when an investor’s emotion tells him to do otherwise. At Financial Alliance, we have been playing that role. Over the years, we have made key market calls that seemingly go against the general market, only to become vindicated with the passage of time. But don’t get us wrong – we are not contrarians in that we intentionally go against the market. Instead, we base our calls on our assessment which depends on fundamental, technical and sentiment analyses. At times, our calls are in line with that of the market; at times, they go contrary to the prevailing view of the market.